We are constantly buying collectors' surplus mint Canadian stamps. Sell of all your excess mint Canadian stamps in one easy transaction, with no waiting. Stamps must be sorted by denomination (value) and counted, ready for spot checking. If you do not want to count and sort, we can accept larger unsorted lots, but must charge our employees' time at the rate of $15 per hour against the final cash value of the lot. (the average lot takes about 1 to 2 hours per $1,000 face value, depending on how the items are stored.). All lots should be accompanied by a listing of denominations, quantities and totals that we can spot-check. (Unless we are doing the work for you). Souvenir sheets and complete booklets should be left intact. Do not break them up into separate denominations. Do not fold souvenir sheets. Be sure that booklets are actually complete. If some stamps have been removed, tear the balance of the stamps out (or cut self-adhesive booklets) so that it does not get counted as a complete booklet. Semi-postal stamps (e.g. 10¢+5¢) must be counted as the postage value only (the first number -- the second amount was for charity). 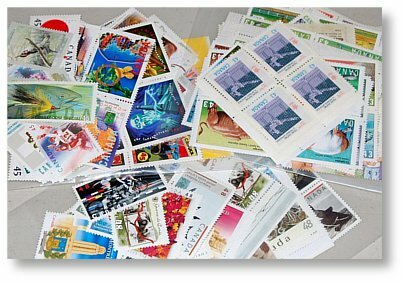 We buy only stamps valid for postage. No Postage Due, Official or Wildlife Conservation stamps. "P" stamps are 90¢ stamps. If you are shipping from outside Canada, your post office will require you to apply a Customs Declaration to the parcel. Declare the CASH value of the contents, not the Face Value. Stamps with values under 10¢. Due to the low value, low demand and impracticality of using values under 10¢ as postage, combined with the high cost of labour in sorting and counting these values, we are no longer buying them. "A" stamps and other issues with no denomination. We cannot use these as even the Post Office does not know how to count them. All offers to purchase are subject to our current requirements. Minimum quantity we are interested in purchasing is $200 face value. Please do not ship without contacting us first!